Perth is starting to get really cold. This weekend I pulled out my coat for the first time in Perth. I have a funny story about my coat actually. Turns out, when you buy stuff on eBay, it’s not always the best quality. Go figure. I bought my coat a couple of months ago so I could have something warm to wear in Melbourne. It cost me $50 and was pretty much what I was looking for. It had an average brand name so I figured it would be made to a satisfactory condition. First morning in Melbourne waiting for a tram, I do up an extra button, pop, off it comes and into my hand. Oh well, it happens. That night when we get back to the hotel I sew it back on using a mini hotel sewing kit. We then go out for dinner after, and as I’m walking to the tram, pop, off comes another. Gees, crappy coat. I guess two’s not too bad. Go back to the hotel, sew it back on. Next day, go to eat breakfast, pop. I give up. I’m not sewing anymore on. The next night, pop. This is just annoying now. The next day another one. The ones I sewed back on are falling off! How is this possible? By the end of the trip all the buttons to do up the coat are jingling in my pocket. I’m cold. Saturday night before heading out I decided to sew them all back on. Finally, back to normal. I went to two bars on Saturday night, took my coat off in the second place, pop. This coat is doomed! So onto these cupcakes. 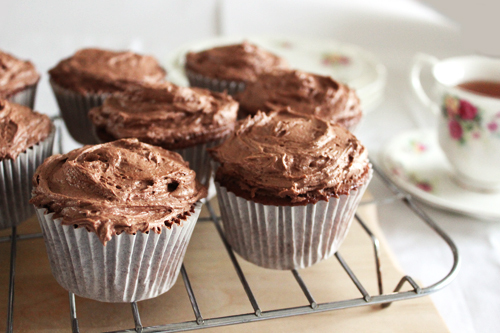 The recipe for these comes from the Hummingbird Bakery cookbook. 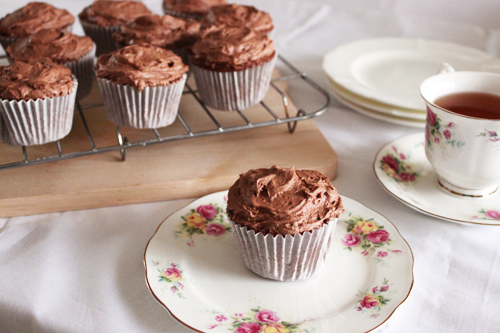 After making the Lavender Cupcakes from the book I had to make chocolate ones. I need the chocolate ones! I altered the recipe slightly as last time I made their cupcakes it only produced 10. This time 11. Strange how that happened again. Preheat the oven to 170°C. Line a 12 hole cupcake tin with paper cases. In a large bowl, add the flour, cocoa powder, sugar, baking powder, salt and butter, and beat with an electric mixer on a slow speed until you have a light crumbly consistency. In a jug, add the milk, egg and vanilla extract and mix until all ingredients are combined. Pour the wet ingredients into the flour mixture slowly, beating as you go. When all ingredients are added, continue beating for a further few minutes until all lumps are gone and you have a smooth consistency. Bake for 20-25 minutes or until a skewer comes out clean. Leave cupcakes to cool before icing. 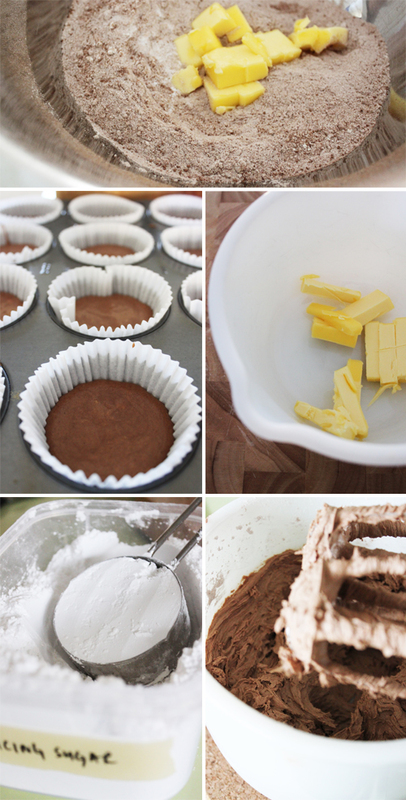 In a clean bowl, add the icing, cocoa and butter, and beat on a low speed until the mixtures comes together. Slowly pour the milk into the icing mixture, beating as you go. When all is combined, beat on high for a further few minutes until the icing becomes light and fluffy. Top the cupcakes with the icing.